Market Value Accounting and Risk | Optimal Market Risk Management Advisors Inc. This perspective posting discusses market value accounting, analyzes some of its revelatory implications, and speculates on the solvency of the global financial system in its current form. The value for every type of financial asset or liability, whether it arises out of market, credit, balance sheet, or insurance activities, is tied to changing conditions of interest rates, equity, foreign exchange, credit, and commodity markets. Exposure to the risk of adverse changes in the value of assets and liabilities exists regardless of whether the originating financial activity is of a traded or non-traded nature. Furthermore, this exposure exists irrespective of whether assets and liabilities are accounted for on an historical book value or current market value basis. Entities of all forms produce financial statements (income , balance sheet, and cash flow) in order to record business activity and manage financial affairs. Assets and liabilities are assumed in order to conduct business, and are recorded on an entity’s balance sheet. For a construction firm, assets include an inventory of cranes, trucks, and other equipment as needed to conduct the business of construction. Liabilities include loans that the construction firm took out either for working capital or long term projects. For a bakery, assets include ovens, an inventory of flour, baking facilities, trucks, and other assets as required to bake, distribute, and sell bread and related products. For most businesses, assets are composed of physical or intellectual property and liabilities of financial instruments such as debt, shareholder capital, and other forms of financing. For lending institutions such as banks, assets include home and business loans where the focus, under book value accounting, is directed towards accruing interest income and loan principal repayments using an historical price basis. The common accounting practice has been to record and maintain assets and liabilities on the balance sheet, over their lifetime, using the original cost at which these assets and liabilities were entered into. An important variation to this approach revolves around the concept of asset impairment, wherein the value of a balance sheet asset is marked or written down, in order to reflect management opinion that the asset in question has experienced a material or permanent impairment in its ability to generate income going forward. This approach is broadly referred to as book value or historical cost accounting, and has generally been in place throughout most of the recorded financial history. Unlike book value accounting where assets and liabilities are generally held on an historical cost or price basis, market value accounting (also referred to as fair value accounting) attempts to revalue these assets and liabilities at the cost or price that prevails in today’s market. The revaluation is performed on a daily basis or as frequently as market data is available. The frequent revaluation of assets and liabilities means that profit and loss is either immediately recognized on the entity’s income statement or made more transparent through the balance sheet. A simple example of market value accounting is the daily revaluation of a portfolio of stocks that trade on various stock exchanges around the globe. There is little value in maintaining an historical cost basis for this portfolio, when the value of each portfolio member is known with reasonable certainty today. The only meaningful relevance of book value in this case is the tax implication of unwinding the portfolio, as the difference between market and historical cost determines gains and losses for tax purposes. Lending and financial institutions in general are unique in that both assets and liabilities are overwhelmingly composed of financial instruments. For example, a bank’s assets include home and business loans, with liabilities as deposits, short term debt, and other forms of bank funding. In pension plans and insurance companies, assets include investments across multiple financial classes such as stocks, bonds, and commodities (as well as physical property such as direct real estate investments). Liabilities include expected future payments to retirees (pension) and beneficiaries (insurance), as estimated using actuarial projections. Developments in capital markets and information technology have resulted in a proliferation of real-time exchange and broker information on assets such as stocks, bonds (government interest rates, swaps, corporate bonds), foreign exchange, and commodities, and have enabled financial organizations to apply market value accounting to market trading activities. Lending activities have generally been regarded as non-traded in nature and not as amenable to real-time market and borrower information to enable the valuation of loans at market with any meaningful frequency. With time, asset-liability management within the treasury function of lending institutions came to rely increasingly on interest rate swaps in order to hedge interest rate risk that arose from term and other mismatches between loans (assets) and funding (liabilities). This created a situation where loans would be accounted for on an historical book value basis, while related interest rate swap hedges would be subject to market value accounting. The ensuing accounting income volatility partly gave rise to new accounting rules under the International Financial Reporting Standards (IFRS) framework, which enabled institutions to suspend market value accounting for interest rate swaps when they are entered into for hedging interest rate exposure from non-traded lending activities. The hunger for investment yield during the decade or so prior to the 2008 financial crisis led to the proliferation of derivative financial instruments on just about any loan or debt instrument available. Everything from mortgages to sub-prime home loans were re-packaged into instruments such as MBSs (mortgage-backed securities), CMOs (collaterized mortgage obligations), CLOs (collaterized loan obligations), CDOs (collaterized debt obligations), and a slew of other derivative instruments. Virtually any loan or debt instrument, regardless of its creditworthiness, would be re-packaged into a derivative instrument, given a stamp of investment-grade approval, and sold to yield-starved investors around the world. Unsold inventory would simply get warehoused on the originator’s balance sheet and get accounted for on an historical book value basis. In September 2006, the Financial Accounting Standards Board (FASB) introduced a new set of accounting standard, FAS157 – Fair Value Accounting, in an attempt to improve the transparency of financial reporting for banks and other financial institutions. One of the primary objectives of FAS157 was to reduce the inconsistency between balance sheet (historical cost) and income statement (fair value) reporting. FAS157 required financial institutions to classify assets and liabilities into a hierarchy, in order to assess and record fair value on the balance sheet, in an effort to move away from an historical book value accounting regime. FAS157 uses a 3-level hierarchy to reflect the level of judgment involved in estimating fair value, as a function of whether or not market inputs are used and whether or not a mathematical pricing model is used in the assessment of fair value. The table shown below summarizes this approach. Level 1 assets and liabilities are the simplest to value since the variables that determine value are readily observable in the market. Level 3 presents the biggest challenge, as information on the associated pricing variables comes from management’s own subjective assessment and valuation uses pricing models. Organizations furthermore have leeway in how they classify asset and liabilities, with many examples of lending institutions migrating between levels 2 and 3 for valuation and financial reporting purposes. Although FAS157 did not explicitly target loans directly, it strongly linked back to loan-related instruments such as CDOs, CLOs, and other loan and mortgage derivatives mentioned previously, generally under levels 2 and 3. These derivatives traded in the over-the-counter (OTC) market and were considered to have sufficient information available to assess fair value. At the height of the financial crisis in 2008, the Securities and Exchange Commission (SEC) released a study on FAS157 in order to assess its impact on the crisis. The SEC study on the effects of fair value accounting stated that ‘some believe that fair value accounting standards have contributed to or exacerbated this crisis, arguing that use of fair value (market value) accounting, particularly when markets are illiquid, has resulted in the valuing of assets well below their true economic value. Opponents of fair value accounting also argue that these write-downs have caused a downward spiral, as they have triggered margin and regulatory capital calls.’ Although the SEC appears inclined to favor market value accounting based on various official pronouncements, it is noteworthy that the SEC had also affirmed its authority to suspend the application of FAS 157, presumably when market value accounting is likely to be needed the most, which is during a market stress event. The SEC study showed that the sampled financial institutions marked less than 1/2 of all assets (45%) at fair value, with banks marking 31% of assets and insurance companies marking 71% of assets. For banks, the low proportion is consistent with the fact that the bulk of their assets are comprised of home and business loans, which are carried on the balance sheet at book value and which flow to the income statement by way of interest income accruals and loan loss reserves. A mere 15% of liabilities were marked at fair value for the entire sample. The bulk of assets at fair value were classified as level 2 assets. Assets classified as level 3 represented 9% of assets in the sample, which equaled over $1 trillion of assets marked at fair value for the study sample. Level 3 fair value entails the most uncertain and potentially subjective valuation approach of all 3 levels, as some of the determinants of value are unobservable in the market and pricing models are used calculate fair value. Market value accounting rose to prominence (or infamy, depending on one’s perspective) as market conditions soured during the 2008 financial credit (debt) crisis, which was driven largely by housing-related loan problems in the U.S., U.K. and Europe. The debate over the utility of market value accounting and the management value it conveys, was amplified following the 2008 financial crisis. This debate has partly been driven by a false intuition that there is little value in acknowledging losses arising out of the revaluation of financial assets and liabilities at today’s market, because of a subjective thinking that these losses may somehow get recovered at some point down the road. Historical global market instances where value did not recover after a prolonged adverse move are too numerous to mention and traverse the full spectrum of recorded financial history. In the credit (debt) world, the general practice at lending institutions has been to carry individual and business loans on the balance sheet using the original value (book value) at which they were entered into. The general accounting process for loans requires lending institutions to hold aside adequate reserves for potential loan defaults, based on the institutions’ risk and financial assessment. Corporate bonds, on the other hand, are generally marked-to-market, as this is more easily done due to the availability of information on the variables that determine a corporate bond’s value (exchange-traded or brokerage information on pricing). On the surface, carrying loans at book value and setting aside reserves for potential loan losses (defaults) may appear reasonable, based on the lack of just-in-time information on changes in the specific credit worthiness of individuals and corporations. As it relates to corporate loans, the growing availability of market information on corporate credit worthiness will contribute to the ability to assign a market value to corporate loans. Examples of market developments in the institutional credit area include credit default swaps; in spite of the harm in credibility this market may have sustained at the height of the 2008 financial crisis, based either on the incompetence, or worse, deliberate fraud of several originating financial institutions. The process of calculating market value is fundamentally the same for any cash flow stream (whether this stream arises from loan payments or corporate bond payments). Broadly speaking, the expected stream of cash flows (interest and principal payments on a loan or corporate bond) are discounted back at prevailing government or swap interest rates with a premium added to compensate for general market conditions, and another added to compensate for the specific worthiness (debt rating) of the loan borrower or corporate bond issuer. The ability to determine market value for any financial instrument is a function of the availability of information on the variables that determine the instrument’s market value. For share prices, this information would include the size of dividends the company is expected to distribute going forward. For an option on a commodity, the price of the underlying commodity would be an important piece of information that determines the option’s market value. For a corporate bond, information such as the corporation’s debt rating would help determine the bond’s market value. Although loans are widely accounted for on a book value basis, having the requisite information on a borrower’s credit worthiness, among other pieces of information, may eventually make it possible to determine market value for any type of loan, whether personal or business in nature. With the availability of borrower information, especially on credit worthiness, it ought to be as practical to calculate a market value for a corporate loan, as for a corporate bond. In an extreme of information availability, it ought to be as practical to determine market value for a home loan. The exponential growth of the information network of highways is laying the foundation for just-in-time information, at depths that could have been only contemplated before. The wider the availability of information on the variables that determine value, the closer we move towards being able to establish market value for any asset and liability, regardless of its nature. The process of leveraging investments with debt is pervasive in today’s global economy. Financial leverage is the process of putting up a fraction of the capital needed and borrowing the rest to buy an asset, as illustrated in the following examples. On a small scale, a home buyer makes a 10% down payment of $50,000 on a home that is worth $500,000, and borrows the remaining $450,000. The borrower in this case is leveraging up the initial home equity investment (down payment) of $50,000 by 10 times ($500,000 / $50,000). 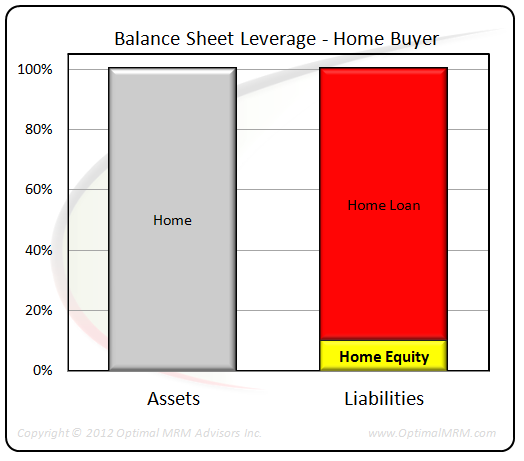 This example is illustrated in the chart below, in terms of percentage of assets and liabilities, in order to put into perspective the proportional size of the home buyer’s equity buffer. All would be expected to go well as long the borrower makes the loan payments in a timely manner, and perhaps more importantly, as long as the value of the home doesn’t fall below the value of the loan outstanding. In reality, trouble would likely arise as the home equity buffer begins to get eroded as a result of falling home prices (market value). On a very large scale and related flip side, a bank starts with $10 billion in shareholder capital and borrows $140 billion (in customer deposits and bank debt issuance), in order to acquire $150 billion in assets (home loans, business loans and other investments). The lending institution’s leverage ratio in this example is 15 times ($150 billion / $10 billion). This example is illustrated in the chart below, in terms of percentage of assets and liabilities, in order to put into perspective the proportional size of the bank’s capital buffer. In much the same way as for the home buyer, the bank will fare well as long as borrowers are able to make their loan payments in a timely manner, and perhaps more importantly, as long as the market value of the bank’s assets (investments and loans broadly secured with the underlying assets – homes, business assets, etc…) doesn’t fall below the value of the bank’s own liabilities. In reality, trouble would arise as soon as the capital buffer begins to get eroded as a function of falling asset value (value of loan and other investments falls as home and business asset value falls, and loan defaults rise). A casual overview of the financial landscape in 2007 suggests that banks were leveraged 10-15 times around at the onset of the 2008 crisis (banks appear not to have materially reduced balance sheet leverage since). The preceding graph is illustrative of a given lending institution whose balance sheet is leveraged 15 times (capital is 1/15th or 6.7% of total assets). At this proportion of capital relative to the bank’s entire balance sheet, it would take less than a 5% drop in the value of all assets to begin eroding capital, and less that a 10% drop to completely erase it. In 2008, asset value came under significant downward pressure whether through write-downs on a market value basis, or through diminished interest income, on a book value basis, as income and loan principal repayments became more doubtful. The deflation of the housing bubble in the U.S., U.K., and Europe coupled with the inability to service home loans drove many borrowers into insolvency, which put downward pressure on the value of banks’ loan assets. This in turn eroded if not wiped out what little relative capital existed to support the scale of lending activities. As a result, many lending institutions were on the verge of insolvency, had they not had their capital position replenished with assistance from governments and central banks. Market value accounting had merely helped to unmask that which had been present all along, but hidden behind the veil of book value accounting. It is intuitive to falsely believe that the introduction of FAS157 in September 2006 triggered the financial crisis in 2008, or that a shortage of liquidity coincidentally emerged in an independent manner. The central issue was (and remains) that loans (assets) were not performing well. By extension, all of the associated downstream derivative activity in contracts such as CLOs, CDOs, and other leveraged investment toxicity had already started to erode capital, regardless of how balance sheets were being accounted for. Market liquidity, or the lack thereof, soon followed, exacerbating the crisis. As the previous illustration shows, the major sources of funding and liquidity for lending institutions are deposits and bank debt issuance (liabilities). With a balance sheet leverage ratio of 15 times for some lenders, what rational investor would sanely have been expected to provide liquidity to these lenders, watching as they were, the decline in the value of their assets on the way to potential insolvency? Liquidity issues arose in the market as a function of poor asset performance, which market value accounting helped to reveal, as opposed to exacerbate or contribute to the crisis. Financial conditions had been precarious in the lead up to the 2008 crisis and well before the rise of market value accounting. With the onset of the crisis, the financial system could barely have taken comfort in book value accounting which relied on historical cost, as opposed to getting some forward visibility from market value, however imperfect the measure may have been. When a 5-10% decline in the value of assets threatens to materially erode or wipe away a bank’s capital, it becomes reasonable to expect market volatility as relatively small as this, to occur with some frequency. The consideration of suspending market value accounting rules in stressed markets is a potentially ominous sign. Choosing to ignore market value in favor of book value can lead not only to the mismanagement of financial risk, but to potential insolvency. With less than 1/2 of all assets across all financial institutions marked at fair value, financial institutions remain apparently inclined towards a book value income accrual model. The implicit hope is that income from assets simply continues to accrue to pay for liabilities and generate some net profit. With the most recent financial crisis, the book value accounting process of setting aside reserves for potential loan losses has once more revealed itself as somewhat inadequate in anticipating market reality. Rather than create volatility, market value accounting has simply made transparent, volatility which has always existed and which has been hiding behind the mask of book value accounting. Where capital can be leveraged as high as 15 times and maybe higher, the existing balance sheet structure of many financial organizations is unlikely to sustain itself during the normal course of market volatility. Market value accounting imposes a discipline that book value accounting cannot possibly generate. Market value accounting forces a rapid acknowledgement of things gone wrong, in order to right these wrongs well before they metastasize into catastrophes. In an information age, the transparency of variables that determine market value is likely to reach into every imaginable asset and liability. Market value accounting is only a messenger of market value, which reflects future expectations into today’s price for an asset or liability. Acknowledging its message may help entities survive, as market reality begins to dismantle financial systems that are inherently unstable.